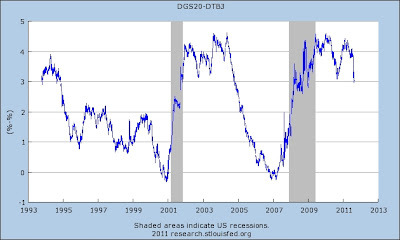 Real Deflationary Men Don't Work! 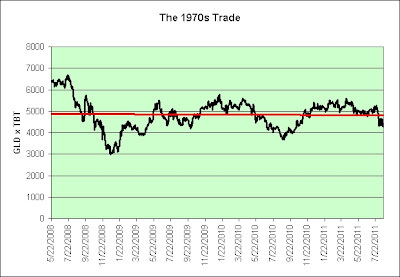 The Perfect Trade for the 1970s? The Fourth Horseman of the Rubicon! Another month has passed. I continue to drink 12 ounces of water and climb an extra 20 flights of stairs each day. On the 22nd I went all out. I climbed the 20 flights in just 3 minutes and 50 seconds. I could not have done that back in June. Since I believe this has become a habit, I felt comfortable doing a couple of marathon runs this month (without the risk of burning out on the stair stepper). Last night I watched the movie Wasabi (subtitled) while stair climbing. That was good for over 200 flights (in addition to the 20 flights I did earlier in the day). It was a fairly leisurely pace. It made me hungry. I ate a large meal afterwards so I'm not sure I lost even an ounce overall, lol. That said, I was doing it as an alternative to just sitting on the couch while I watched the movie. I do not feel compelled to do the marathon runs. They are not part of my plan. If they happen, they happen. If not, that's okay too. The gains in Dr. Boreham’s study are modest enough that you shouldn’t view taking the stairs as the only thing needed to stay fit. But they offer encouraging evidence that simple decisions to be more active in your daily life can add up to measurable health benefits – even if you can’t climb the CN Tower. I'm a believer in the theory that small simple decisions can eventually produce large measurable effects. 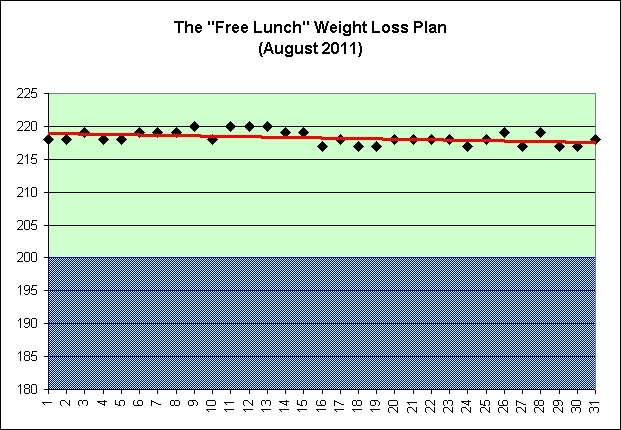 That's why I am posting these weight loss charts. Dr. Boreham's study covered just 8-weeks of stair stepping. It started off at roughly the same intensity as my plan but became more intense. However, my plan is at the 13-week stage and will hopefully become permanent. So far, so good. 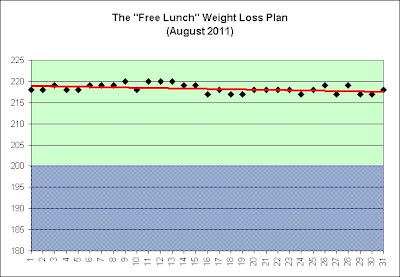 And lastly, no weight loss plan would be complete without some sarcasm. The researchers are now investigating whether the protocol can be transferred to older adults, using a stepping machine rather than staircases. I'm 47. Will climbing stairs benefit me too? Can a stepping machine actually replace staircases? I anxiously await the results of the new research, lol. 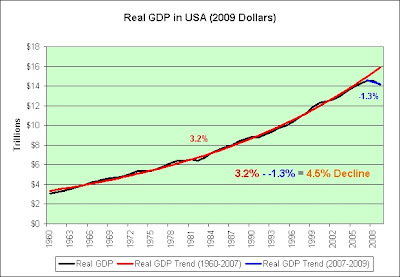 I've included recession bars and 3 linear trend lines. Markets are unstable and they've been unstable for more than a decade. WASHINGTON (AP) -- Economists have advice for anyone worried that consumers are too fearful to keep spending: Look at what they're doing, not what they're saying. Fair enough. Here's a look at what consumers are doing. Ouch. 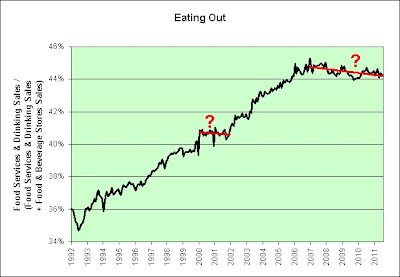 The chart above shows our preference for eating out over eating at home. There were probably better times in all of recorded history to open a new restaurant. Let's just put it that way. Yeah, it's almost like an economic disconnect. Consumers say one thing, do another, then that information gets spun to show something else entirely. Yeah, it's like a sugar rush! In the chart that follows I am comparing the average inflation adjusted price of oil over the previous 5 years to the inflation adjusted returns of 3 month treasury bills over the previous 5 years. Just look at all that circle turning. But three Fed members opposed any steps to tackle the slowdown, citing fears of sparking inflation, the minutes show. The resulting vote was 7-3, with the three dissenting votes based on the inflation fear. It was the first time in 20 years that many members have dissented. 70% don't seem to mind rising oil prices. 30% would prefer turning circles. Who really thinks the Fed can save us? The economy has never contracted with the difference between 10- and 30-year Treasury yields as wide as the current 1.34 percentage points, or 134 basis points, since the so-called long bond was first issued in 1977. Never! So here's a brilliant thought. Let's just peg short-term interest rates at zero forever. 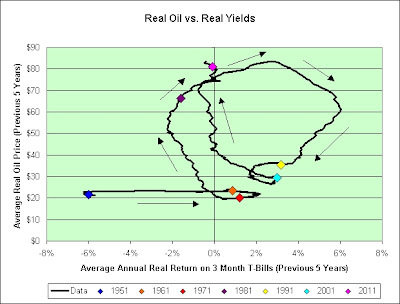 No more inverted yield curves. Hurray! We've already done it for 2 1/2 years. Let's shoot for infinity. 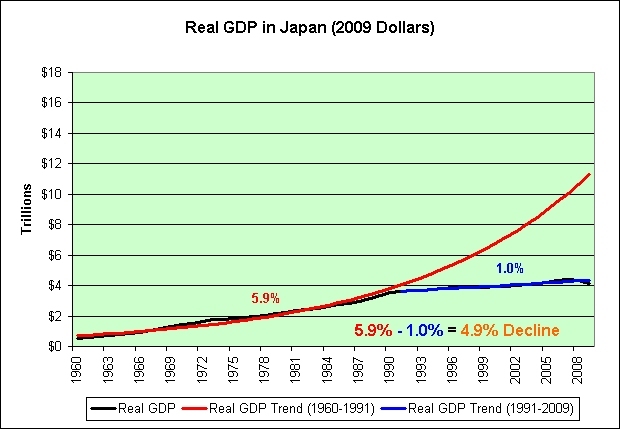 Unlike Japan, I'm sure we'll NEVER have another recession. Why hasn't anyone thought of this before me? Genius! Here's a chart showing the average spread between the 1 year treasury and the 10 year treasury in a given quarter and then comparing that to the real GDP growth of the following quarter. 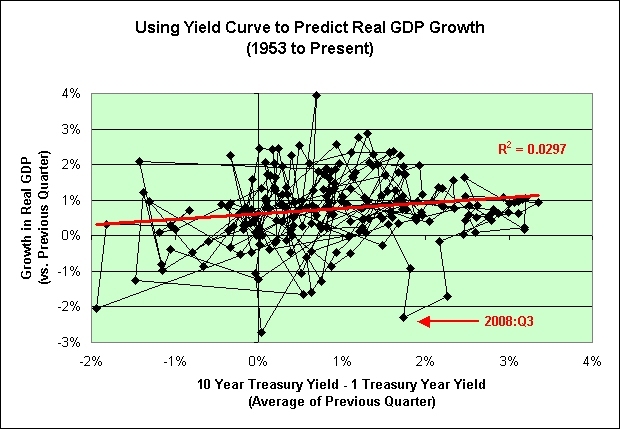 As you can see, the bond market is an amazingly brilliant forecasting tool. It sees all! It is comparable to what untrained monkeys could do! Yes, sir. Time to go long stocks. No doubt about it. Stocks have fallen a bit like they did in mid-2008. 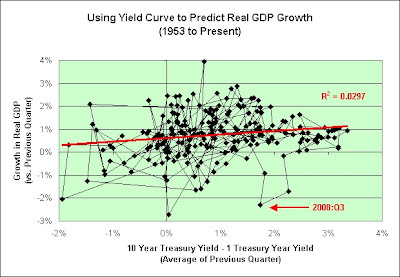 The yield curve is similar to that in mid-2008. I'm incredibly optimistic that nothing can ever go wrong again. Everything has been permanently fixed. And when I say fixed, I really mean bribed, bought off, corrupted, fiddled, greased, maneuvered, string pulled, and tampered with. Nothing but biscuits and gravy from here! Speaking of the word never, we've never seen $4 gasoline without there being a recession in the months that followed. Never! Yeah, we're 1 for 1 so far. I'm not counting the most recent spike to $4. We don't yet know how that will work out. 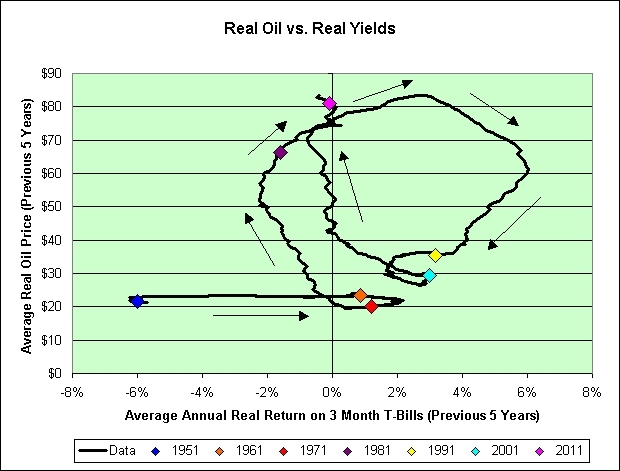 So what happens when an irresistible oil force meets an immovable yield curve? Brace for impact! The S&P 500 closed above 1,200 for the first time in two weeks as traders seized on better than expected consumer spending figures to propel a broad market rally. NPD Group restaurant analyst Bonnie Riggs says Kaplan's idea sounds interesting, but he warns that the restaurant industry overall has just gone through "the most prolonged period of weakness we've ever experienced" with eight straight quarters of declining customer traffic. Just say no to jobs! Don't need 'em! The wise men apparently presented just three gifts, but the stock market has presented three gifts raised to the third power! 3^3! That's 27 divine gifts! Turning back now would be an insult to the "powers" that be (TPTB)! Some analysts think stocks, for instance--which have fallen 17 percent from their April peak and are down about 10 percent for the year--are undervalued, with smart investors gradually adding to their stock portfolios over the next several months. A chronically anemic economy will probably keep the value of the dollar low against other major currencies, which would be a boon for exporters and anybody selling goods priced in dollars to foreigners. Nothing says smart like investing in chronically anemic economies. The proof can be found in the 27 rubicon crossings! Is the stock market ripping you off? Are you thinking that maybe the stock market is a rip-off? How did they drag me into this? Since when am I supposed to be a stock market investor? Can't we go back to the "old days" when I could count on a pension and Social Security for my retirement? Who came up with the idea of a 401k plan, which requires me to make investment choices? Someone who likes to earn a percentage of your nest egg each year. Is there any rational way to make investment decisions in a market like this? Is this the end of America as we know it? Why do I have to invest in the stock market? Why don't we have pensions anymore? Aren't professional managers, by definition, better at this? Why invest for the long run? You intend to live long. Wouldn't it be better to start investing during the good times? Trick question. Good times aren't coming. That quiz wasn't nearly as difficult as I thought it would be! "We've had a couple of years of 0 percent inflation rate, so a couple of years of 8 or 9 percent inflation rate is good for the economy." Yes! Two wrongs always make a right! Nothing would spur our economy more than destroying all remaining Fed credibility, enabling global oil speculators to go cuckoo crazy, and enabling fringe conspiracy theorists to convince the vast majority of the planet that the end times are indeed here! Can't you just picture the job creation in such an environment? Partly reflecting an oil embargo in 1973 and disruptions to the oil supply in 1979, the economy in the 1970s experienced periods of inflation, recession, and high unemployment. The economic conditions led to price controls and new and enhanced programs to combat poverty and unemployment. I, Stagflationary Mark, would ask Roger Myerson one simple question. You just need two things. 1. Toxic assets. No zombie movie would be complete without them. 2. Favorable winds to spread the disease. Let's turn our attention to the United States. In order to keep our banking system somewhat stable in appearance, it is my belief that interest rates must continue to fall like they have since 1981. On the one hand, one might think that we're at the end of the road. Maybe we are. Once the red trend line meets up with the blue trend line then there can be no more can kicking. 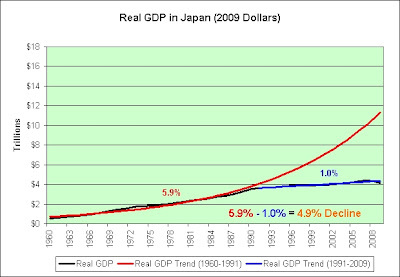 On the other hand, what would happen if the inflation rate came down a bit? It really wouldn't take much. Banks make their money by borrowing short and lending long. 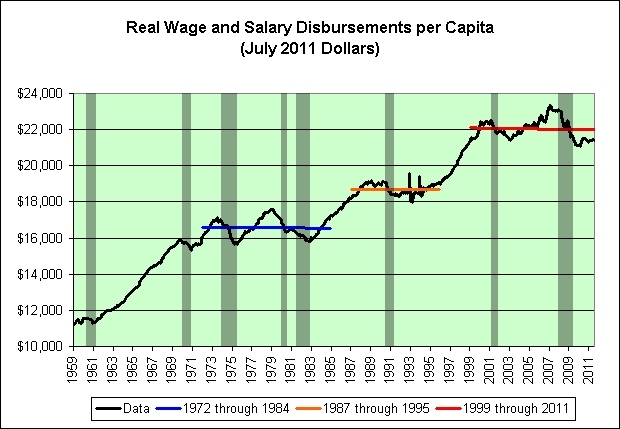 Further, they don't exactly complain much if the money they lend long actually manages to keep up with inflation. Go figure. Therefore, if you really want to know what central bankers will do, then perhaps it is best to think like a bank. 1. Borrow at low interest rates. 2. Lend at high interest rates. 3. Keep inflation below the lending rate. 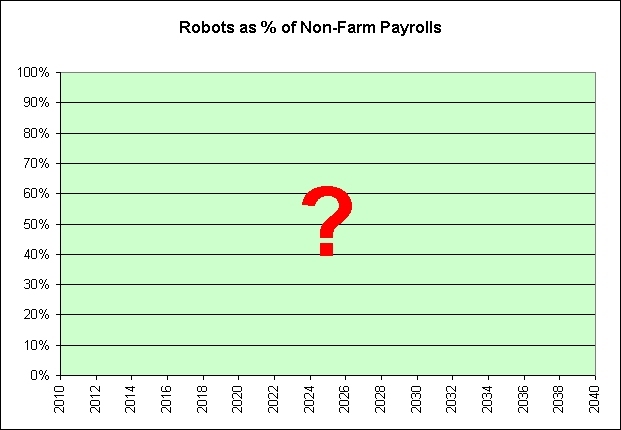 If the Fed does much more then both #2 and #3 are at risk. The 166,000 increase in nonfarm payroll employment in October reflects the great resilience of the U.S. economy, Congressman Jim Saxton, ranking member of the Joint Economic Committee, said in a statement today. The following chart shows the federal funds rate minus the 3 month treasury bill yield. 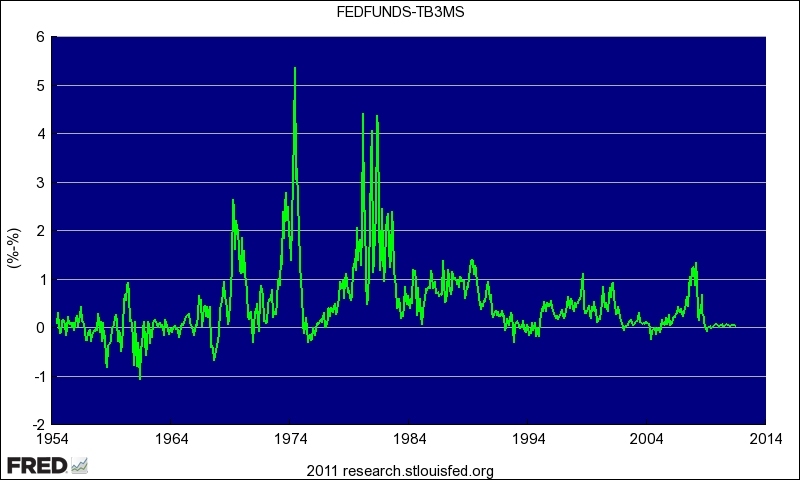 As of January 2009, both the federal funds and the three month treasury have flatlined. This chart shows the spread between the 20 year treasury and the 3 month treasury bill. What will Bernanke do on Friday? I could be wrong, but put me in the all bark and no bite camp. When QE2 was announced in November 2010 the spread was widening at a fast pace. Long-term interest rates were rising. The spread is currently contracting at a fast pace. Long-term interest rates have been falling. 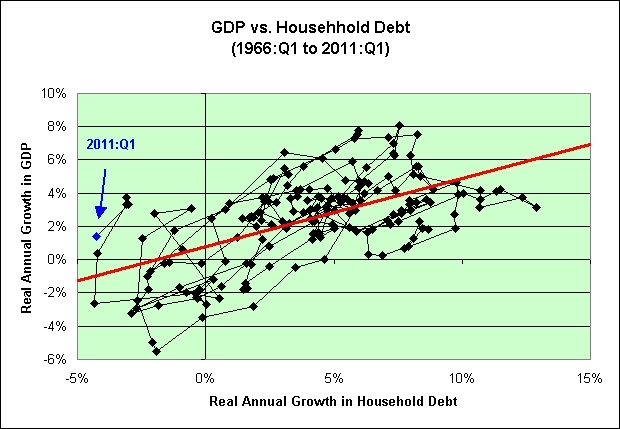 I just don't believe that Bernanke will stick his neck out. The market is doing his job for him. I was one of them (although I chose long-term TIPS). (Reuters) - Whether the Federal Reserve likes it or not, its unprecedented monetary polices over the last few years have conditioned the financial markets to expect a helping hand when the going gets tough. It remains to be seen how much more hole punching the stock market can take. Single hole punches are often used to punch tickets, which indicates its credit has been used, and to make confetti when creating scrapbooks and other paper crafts. I love it when a good pun comes together like that! In the United States, single hole punches are often used to punch holes through playing cards, rendering them "used." This helps cut down on cheating by eliminating any cards that may have been tainted by players. And even that! You know what they say, if one must fight-or-flight the Fed, then at least fight-or-flight early. 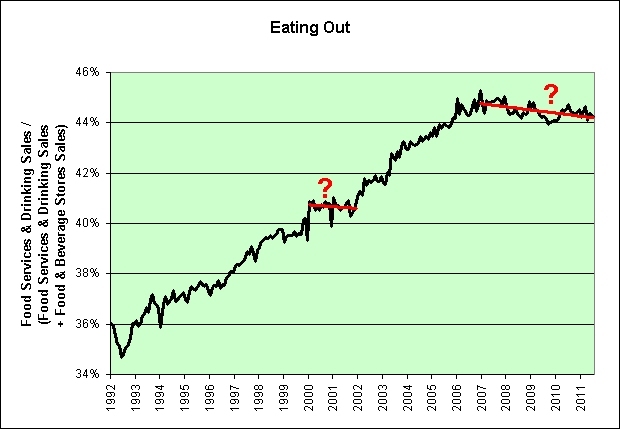 Based on the performance of the S&P 500, that would have been about 15% ago. Yeah, last month. I could be wrong of course. It's just an opinion. Warning: This post contains heavily leveraged sarcasm. The preferred shares pay a dividend of 6 percent per year, and are redeemable at any time by Bank of America at a 5 percent premium. We know that Bank of America is fully capitalized. That pretty much goes without saying if you read the opinions of potentially unbiased analysts who are coincidentally bullish on the stock. I therefore offer Bank of America another source of cheap funding. Central banks are flooding the world with cheap money and the markets haven't moved much. Interactive Brokers will lend one million US dollars at just 1.3% for every 200,000 USD in your portfolio margin account. See our high dividend scanner for the many hundreds of stocks that yield over five percent. Please note that portfolio margin accounts are only for experienced investors with USD 100,000 minimum account equity. 1.3% would seem to be a lot better deal than 6%. I'm surprised that Bank of America isn't taking advantage of the great offer. It isn't just my opinion though. Check out this stellar review from Epinions. Using margin?? You need IB! Without prior notice, the margin maintenance requirement in my account went from 50% to 70%. When I sold some DNDN call options to raise cash, Ameritrade raised my margin maintenance requirement from 70% to 80%!!! The cust service rep explained that by selling the options, my account's concentration in DNDN stock exceeded 90% resulting in the 80% margin maintenance requirement. And no, there was nothing they could do (even though my wife and I have other accounts there). To avoid having to sell out a hefty portion of my DNDN stake, I was forced to move my account, and in the process I found the best online broker I've ever heard of. I haven't seen any promotions, and I'm not aware of any referral benefits, so I don't stand to profit by this testimonial. I just feel like it's the 'epinion' thing to do to let folks know when I find a good deal. Interactive Brokers allowed him to keep his heavily leveraged DNDN stock in 2007. How lucky is that? Okay, in hindsight maybe not all that lucky. 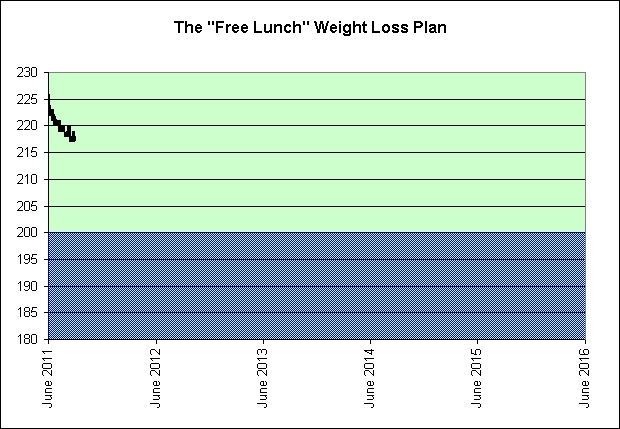 The point here is that this is the land of the free (lunches). We should be allowed to lose all the money we want without companies like Ameritrade messing it all up for us! Similarly, we should allow big banks to lose all the money they want too! It isn't like they'll ever come looking for us to bail them out again. As a side note, fried left me this comment today. On CR today, one poster was lamenting the fate of savers and was answered by another that holding dividend paying stocks was the solution. Interactive Brokers offers a "high dividend scanner for the many hundreds of stocks that yield over five percent" that would apparently be perfect for a 5-1 leveraged margin account. One million dollars of high dividend stocks for just $200,000? I think I just died and went to heaven! The following chart compares the real growth in GDP to the real growth in the DJIA index over the previous 5 years (using data going back to 1947). 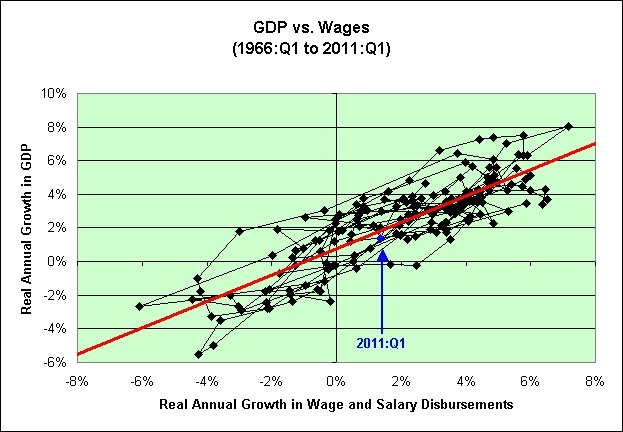 I'm using the consumer price index to adjust both data sets for consistency. Dividends are not included. As seen in the chart, we were slightly above the trend line in Q2. The stock market has sold off since then as GDP figures once again came in a bit disappointing (to say the least). 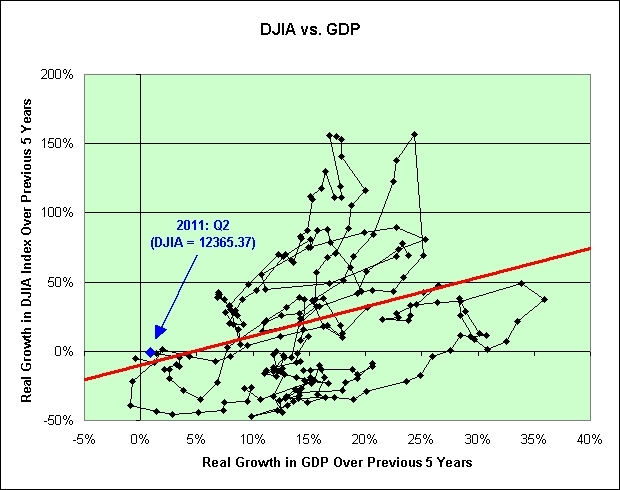 Also note that zero real GDP growth probably won't lead to zero real DJIA growth. The stock market should actually behave worse than that. This goes counter to the opinion of Jeremy Siegel, but what's new? To be sure, real growth since 2000 has been a much lower 1.3%, but there have been two recessions over the past decade, the last one being the most severe since the Great Depression. That is supposed to bring me comfort? 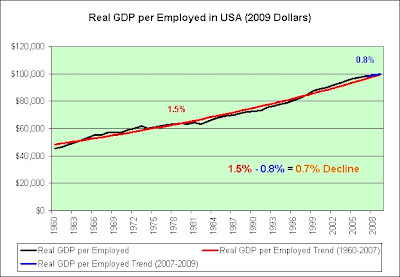 And what will happen if we enter the next recession with unemployment at a level near where it is now? Then what? 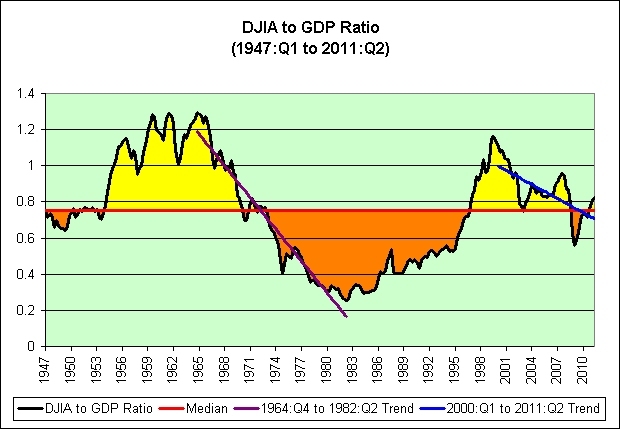 Now let's turn our attention to the DJIA to GDP (in billions) ratio. As some of you may know, I'm a big fan of ratios around here. This is a chart for those who value safety and bargain hunting. As of Q2, we were slightly above the median. Knowing all that you know now, would you expect it to be doing that well? I for one would expect it to be far below the median. Perhaps these things just take time (as seen in the blue trend line). 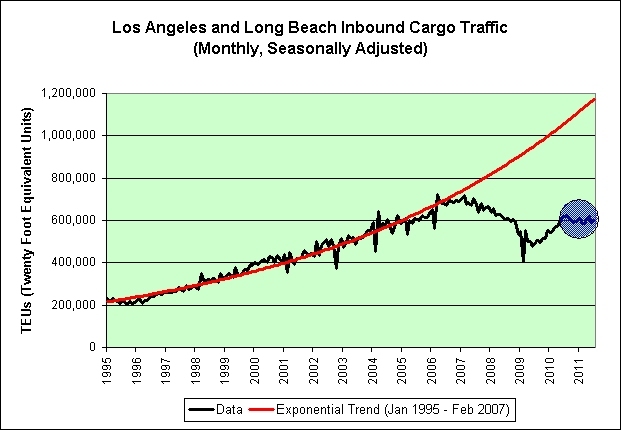 Let's discuss that median trend line. In order for a median to make sense, you must spend about as much time below it as you do above it. The time above it can be seen in yellow on the chart. The time below it can be seen in orange on the chart. Where is the missing orange to balance our bubbles over the last decade? How much more orange are we going to see in the years ahead? Perhaps the answer is none. I suppose it could happen. Perhaps Bernanke can magically prop things up for all eternity. I'm certainly not willing to risk my nest egg on that outcome though. Further, if Ben Bernanke really did wield that much power over all time and space then why wasn't he propping up our markets earlier? Who wouldn't have enjoyed some bonus prosperity? Oh. Here's a crazy thought. Maybe the Fed was propping it up earlier! 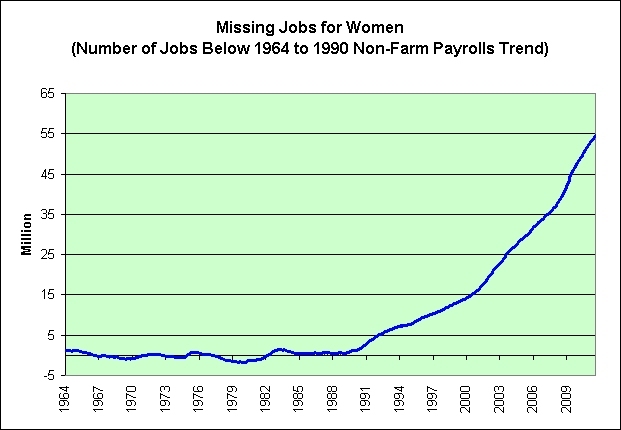 Maybe we really did have some temporary bonus prosperity. Crazy thought. Crazy. 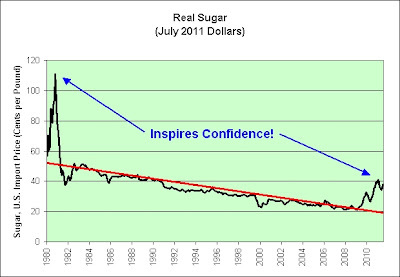 This is yet another example why I am willing to hold long-term inflation protected treasuries. I respect that blue trend line since it backs my personal belief in the illusion of prosperity. 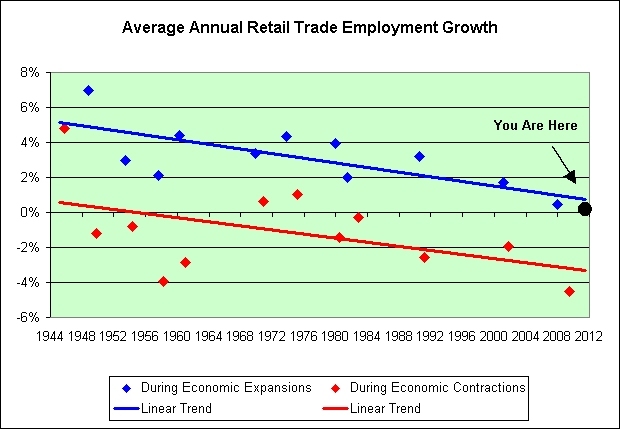 And lastly, please note the purple trend line. It began in 1964. That was the last year we decided to put silver in our junk coins. In hindsight, how well did that work out for us in the decades that followed? I guess free lunches aren't really free. Eventually we pay for them. As I see it, we will also be paying for the free lunches we're being served today. It is only a matter of time. Sigh. Both gold investors and TIPS investors took a shellacking over the past week. GLD and TIP investors are both down about 3% over the past 5 trading days. Meanwhile, SPY investors are up about 2%. 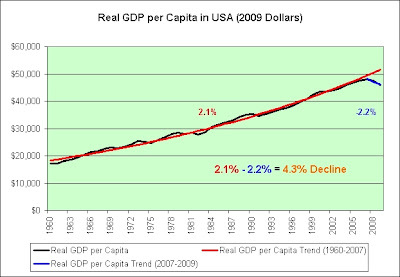 Has prosperity been fully restored? I might be a bit biased based on my blog's name, but somehow I kind of doubt it. 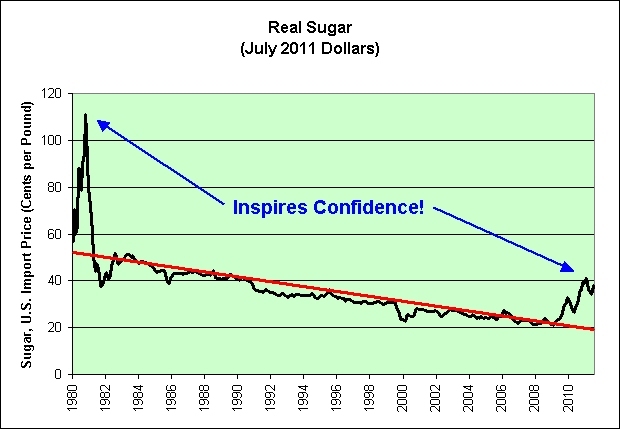 Keep in mind when looking at the 5 year chart that TIP's distributions include both inflationary gains and interest. (The interest that TIP currently pays it negligible.) It has therefore done better than the chart implies. 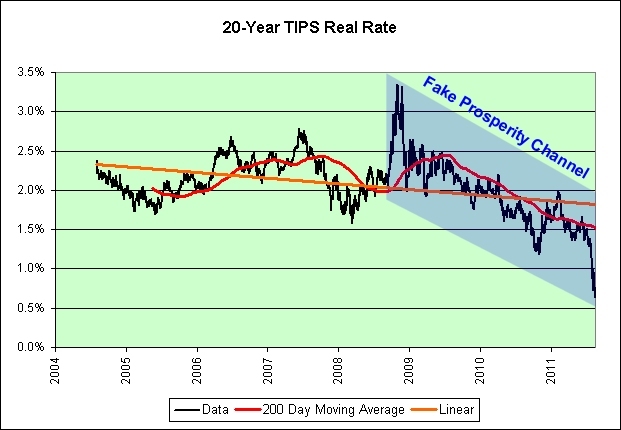 If interest rates remained constant, then TIP's price would likely remain constant too. SPY pays distributions based on dividends (although any inflationary gains are reflected in the price). 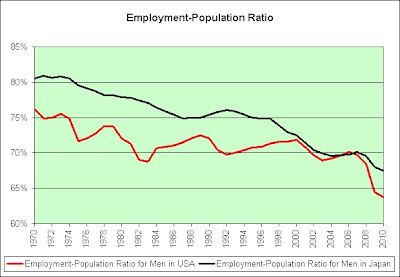 It too has done better than the chart implies. So far, hindsight shows that I would have done well lightening up on the 30 year TIPS bonds. I certainly gave it some thought. I have no desire to do it now. As the price of things fall, so too my thoughts of selling. 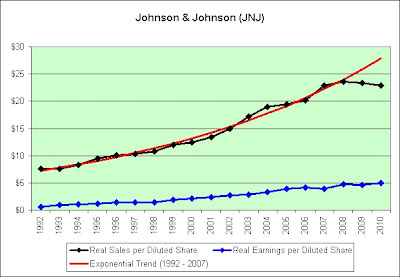 Johnson & Johnson is one of the last AAA rated companies in this country. Of the 4 that remain, it interests me the most from a long-term investment standpoint. I went through the shareholder reports today and created the following chart based on what I found. 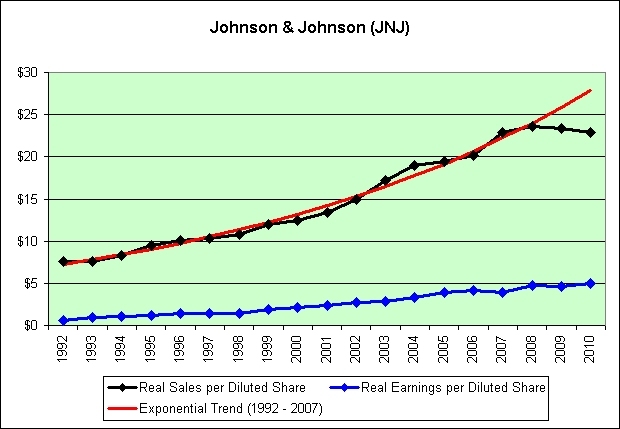 It shows inflation adjusted sales and earnings per diluted share going back to 1992. I've also added an exponential trend line based on the sales data from 1992 to 2007. When combined with a flat stock chart over the last decade, this is exactly the sort of thing that I was always looking for as an investor. There's one problem though. I do not trust the real sales per diluted share trend. 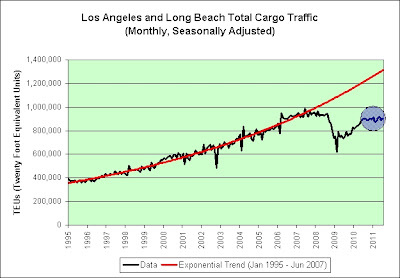 Since I am bearish on our economy long-term, that is not the sort of exponential trend failure that I want to see during a supposed recovery. Am I being too pessimistic to pass on this stock as a suitable long-term investment? Perhaps I am. In fact, I hope I am. I would sleep better if prosperity was restored. However, I do not have a job to fall back on if I am right to be bearish. If the recent decline in real sales per diluted share continues then eventually it will affect real earnings per diluted share (even more than it already has). On the one hand, this company currently pays a juicy 3.6% dividend and has an excellent long-term track record. I would certainly not fault people for taking the risk. On the other hand, I have owned stocks with juicy dividends and excellent long-term track records in the past. Citigroup comes to mind. I sold it in 2004 along with the rest of my stocks. If I can't seem to get myself interested in one of the last AAA rated companies, then there is little hope of sparking my interest elsewhere. Ben Bernanke can entice me all he wants. I continue to embrace safety in spite of him. I do not believe that he has the power to actually create prosperity. Disclosure: Long TIPS, I-Bonds, and cash. The Bangor couple, a 23-year-old man and a 17-year-old female who turned 18 on Sunday, told the investigating officer that they had purchased two cases of water with funding provided by the Supplemental Nutrition Assistance Program, formerly known as the Food Stamp Program. The bottled water cost around $6 and the duo got $2.40 back in cash from the redeemed bottles. The couple managed to convert $12 of food into $4.80 in cold hard cash. It would seem that hyperinflation has been postponed yet again. Cash apparently still has some value. Go figure. 400 is roughly where the S&P was before the "great bull market of fraud" began in 1995. To think we can't return there when the fraud collapses is utter folly. We not only can, we probably will. The S&P 500 closed at 459.27 on December 30, 1994. 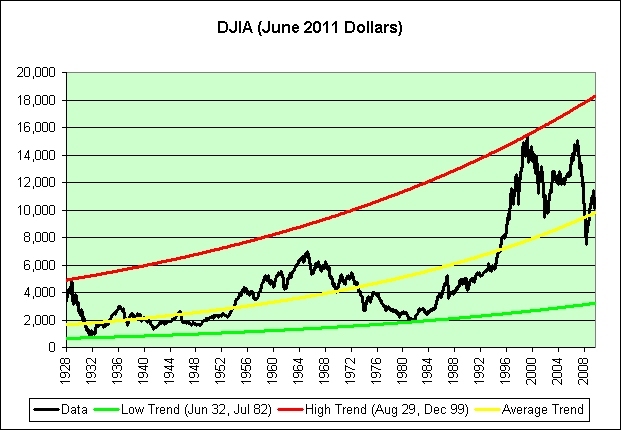 The DJIA closed at 3,834.44 on December 30, 1994. 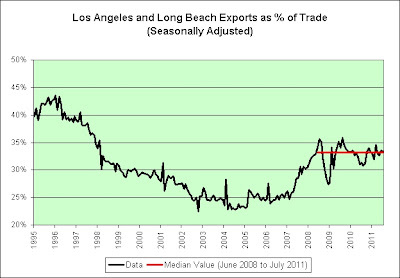 Note the green trend line in the chart. Treasuries fell amid speculation Federal Reserve Chairman Ben S. Bernanke will signal additional measures to stimulate the economy, damping demand for the safest assets. Here's an alternative headline that means exactly the same thing. There's just no arguing with that logic. 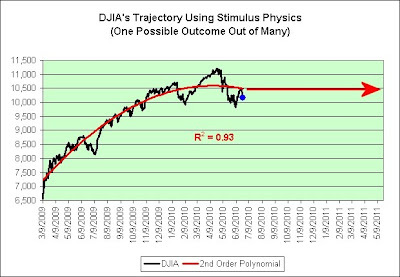 In my last post I concluded that the stimulus physics model I was using is beginning to break down. I clearly need to start thinking of another model to replace it. 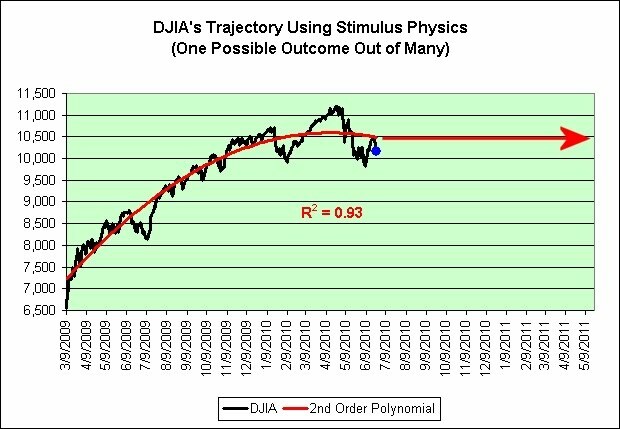 The most obvious path is that the stock market just continues to roll over. It is hard to believe in the obvious though. I typed "double dip" in Google and it actually tried to help me by adding "recession 2010" to the end of it. Go figure. We are now off the chart to the right and a mere 354 points from the line established by the red arrow. In all seriousness, I offer this thought experiment as the basis for my long-term prediction. If you were in charge of kicking economic cans down the road and you knew for certain that our standard of living would fall no matter what you did, then what path would you choose to get us there? If it was me and I was into kicking economic cans down the road, then I would shoot for stagnation in the stock market. I'd keep prices flat and allow the slow grind of inflation to do all the work for me. 1. A slow grind creates less turmoil than massive losses all at once. There is less chance for panic. 2. With hundreds of trillions of dollars of derivatives in existence, flat would seem safest. Change creates stress. Stagnation is the very essence of non-change. 3. Those long the market would adjust slowly to the new reality. 4. Those short the market would have a harder time making out like bandits. 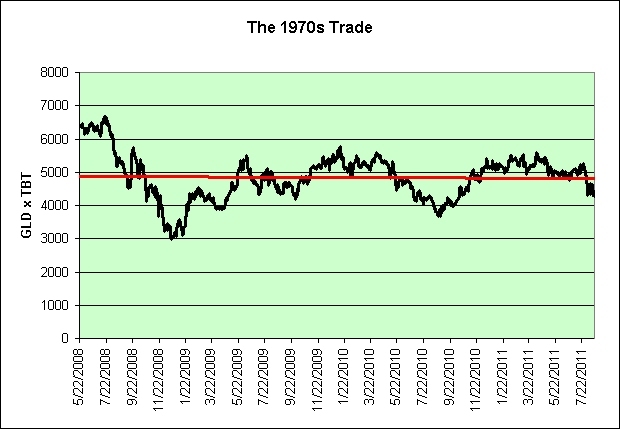 In nominal terms, the stock market was flat during the 1970s. 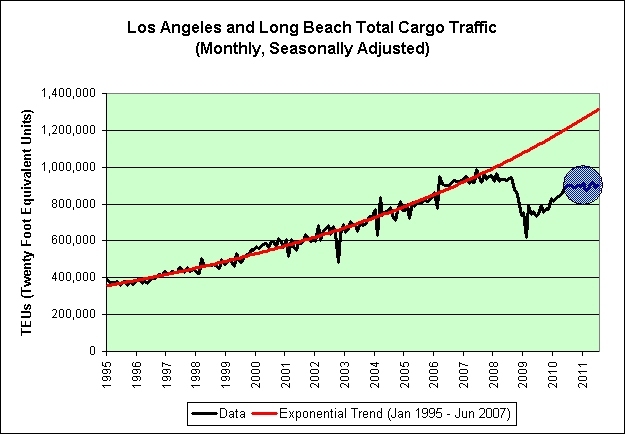 It was also flat in the 2000s. I do not necessarily think this is a coincidence. That said, there is a lot of risk out there right now. This is more of a long-term prediction. Anything can happen in the short-term. This Christmas season comes to mind. Sigh. 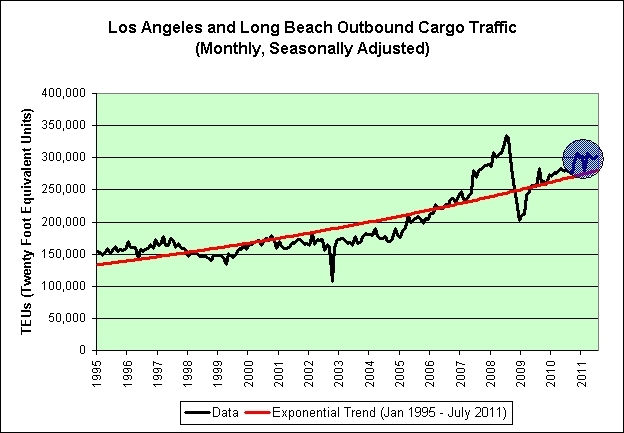 The chart shows the average annual growth rate since the last peak (for contractions) or last trough (for expansions). Based on the downward trends in this chart, is it any wonder that I am bearish? And if you believe that then please consider investing in this wonderful opportunity. You simply can't lose! This post inspired by Audrey from the comments of the previous post. Wall Street gave us two ways to participate. GLD is a gold bullion fund. TBT is an ultra-short treasury fund. Just picture the massive profits if we multiply the share price of GLD by the share price of TBT. Well, you don't have to picture it. Here's a chart! Wall Street sure has a way of popping the 1970s party. That trend line is a sight to behold. Just look how flat it is. That's a whole lot of nothing. Once trading fees are factored in, it's like entering a casino and working your way over to the roulette table. Those who owned gold? Nicely played! Those who shorted treasuries? Sorry! Better luck next time. This is just one more example of why I think we're trying to combine the very best of the deflationary Great Depression with the very best of the inflationary 1970s. High unemployment was common to both eras of course, as was stock market weakness. The term originally referred to the years 1991 to 2000, but recently the decade from 2001 to 2010 is also sometimes included, so that the whole period of the 1990s and 2000s is referred to as the Lost Decades or the Lost Years (失われた20年, Ushinawareta Nijūnen). 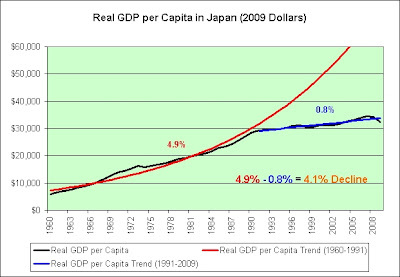 Japan went from an annual exponential growth rate in real GDP of 5.9% to 1.0% after their housing bubble popped. That's a 4.9% decline in the growth rate. 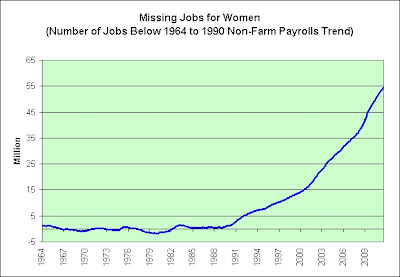 This pattern continued for two decades and shows no signs of improving. 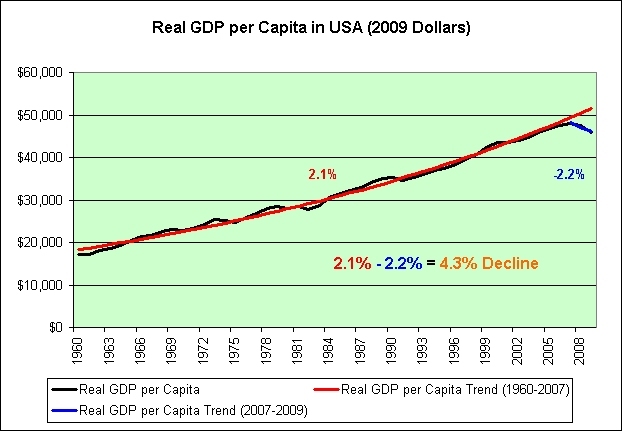 The USA went from an annual exponential growth rate in real GDP of 3.2% to -1.3% after our housing bubble popped (through 2009). That's a 4.5% decline. Will it too continue into the distant future? We better hope not. 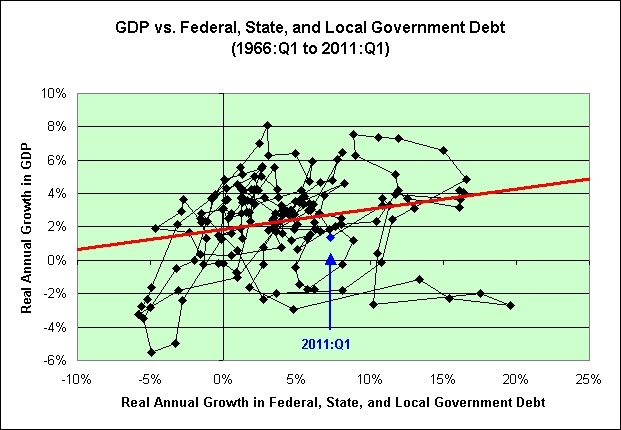 A similar story is told by comparing the drop in real GDP per capita growth. 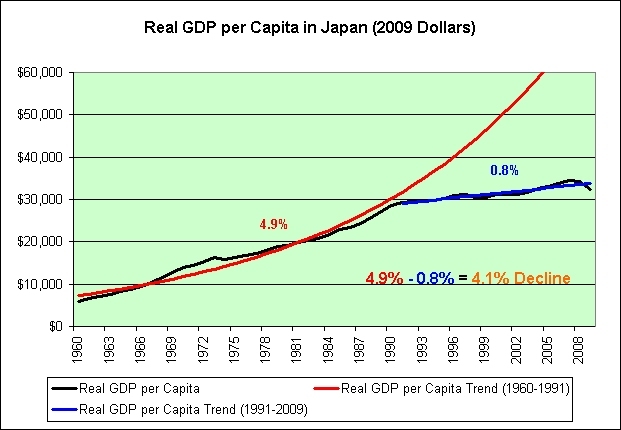 It clearly isn't just Japan's declining population that's the problem here. 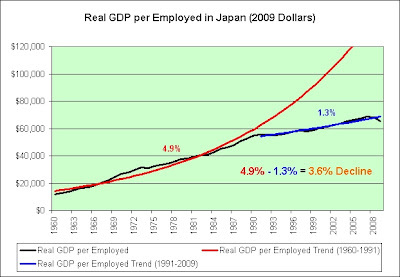 As can be seen in these last two charts, Americans would seem to be far more efficient at laying off workers than Japan. 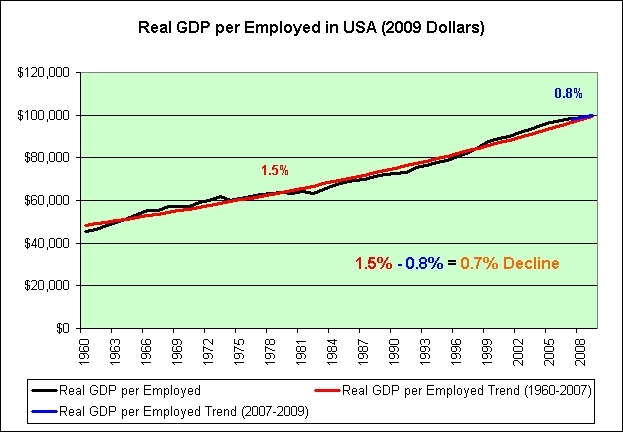 The growth in real GDP per employed worker has taken a much smaller hit. Please note that the data only goes through 2009. 2010 showed some improvement but 2011 is iffy at best. I have serious doubts that the improvement is sustainable and I think the markets are starting to doubt it too. I've been giving some thought to locking in some profits on long-term TIPS but after thinking about these charts (the first two in particular) I'm content to hold them. Even today's 0.93% real rate on 30 year TIPS could look pretty good in hindsight if we experience 2 or more lost decades of real GDP growth. That's my theory and I'm sticking to it. I said in the comments that I was thinking about making a decision tree to help me decide whether or not to lock in profits. The tree sort of ends here. 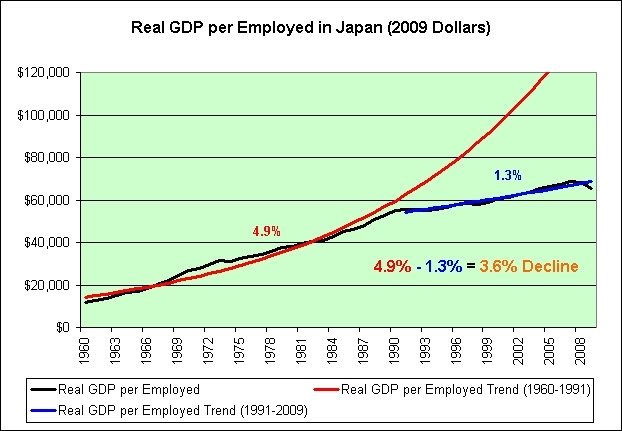 My concern that we slide into Japan's long-term stagnation mess is just too great. TIPS and gold tend to move together. Both rise as real interest rates fall and both rise as future long-term growth assumptions fall. A 5 year TIPS matures in 5 years. A 10 year TIPS matures in 10 years. A 20 year TIPS matures in 20 years. Gold matures in infinite years. If real interest rates fall 1% evenly at every point in the future then how should the price react? A 5 year TIPS rises about 5%. A 10 year TIPS rises about 10%. A 20 year TIPS rises about 20%. So what would gold do? It has an infinite maturity. I don't think it would be rational to argue that it would rise infinity percent but I do think it could be rationally argued that it could rise more than 20%. Let's look at the recent data. I'm up roughly 35% on the 30-year TIPS I bought in February. Gold investors are up roughly 35% on the infinite-duration gold they bought in February. The rise in gold since February matches the rise in long-term TIPS since February. Since I believe that the move in TIPS has been somewhat rational then I must also believe the move in gold has been somewhat rational. Based solely on this information then I should be no more of a gold heretic now than when gold was roughly $1400. In general, that's probably true. That said, the same gold process should also work on aluminum. If it does not, then something else is going on too. That something else is what I have a problem with when it comes to gold at these prices. 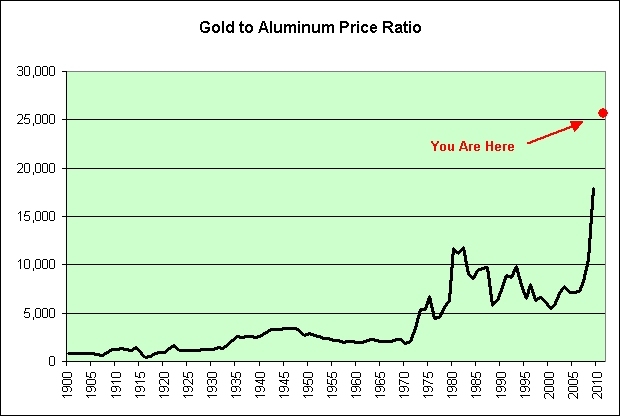 In other words, if aluminum was keeping up with gold then I would not be a gold heretic. The price action in aluminum vs. gold would definitely make me nervous as a gold investor. It doesn't make me nervous as a TIPS investor though. I am tied to general price levels (as reported by our government, which can in theory make me nervous). If gold falls compared to aluminum then I'll still do okay. Think the 1980s and 1990s. Gold was falling even as inflation was rising. It also does not make me nervous because I plan to hold my TIPS until maturity. The lack of maturity for gold has been its blessing but it can also become its curse. Having no maturity means that gold investors must someday sell it to someone else and it is the hope that there will be a buyer. There may be a great many buyers. There may be few. Who really knows? I sure don't. That's the risk. And lastly, perhaps I would see things differently if I was younger. In theory, I do not have needs that need to be met infinitely far into the future. I'm more concerned about the time frame 30 years from now. I'll be 77 years old and I have no children. I intend to exhaust most of my nest egg and die mostly broke (of old age hopefully). After a brief respite, stocks are plunging again. We're retesting the lows, but the bottom hasn't fallen out. Do not panic unless the bottom falls out. Gold trades at $1,823.20 per troy ounce. Aluminum trades at $1.0376 per pound. There are 14.5833333 troy ounces in a pound. 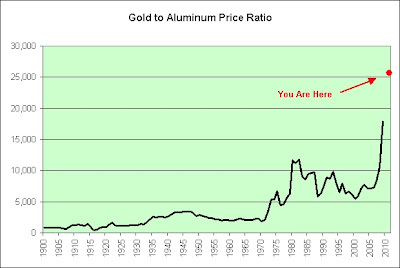 The current gold to aluminum price ratio is therefore a whopping 25,625 to 1. Selling just 5.74 pounds of gold will now allow you to buy all the aluminum needed to make a 747-400. Gold is apparently the only asset on the planet that is a safe haven at any price, or so the "Fast Money" theory goes anyway. Over the long-term, I'm just not a believer. We live in the era of bubbles, booms, and busts. At what point are we going to realize that if something seems too good to be true then there must be at least some risk involved? Another month has passed. The conclusions remain the same. 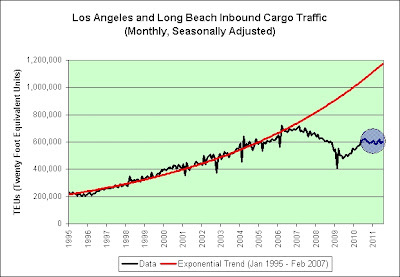 The chart above shows a complete and utter exponential trend failure. 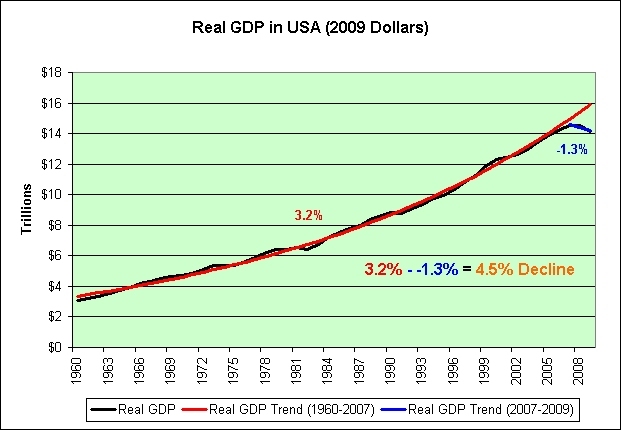 If the red trend line represents normal, then there is absolutely no chance of returning to normal. This has huge implications for US retailers, Chinese manufacturers, and global long-term investment return assumptions. 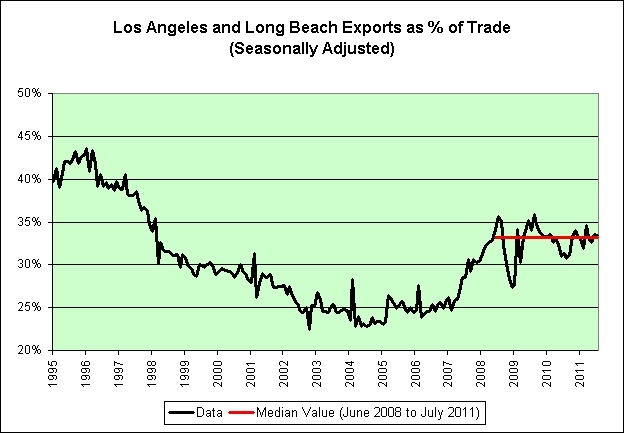 In my opinion, exports rose due to dollar debasement. The rest of the world seems to be catching on. If it works for us, then it must work for them too! There's just one problem of course. It can't work for everyone simultaneously. To put it bluntly, global trade is leaning on the ropes, gasping for breath, and is having its head pummeled by the fists of stagnation. If it was our goal to close the trade deficit and once again become a fully sustainable economy, then we've clearly got a LOT of work left to do. I'm bracing for more deflation in the short-term, but I think stagnation will eventually turn into stagflation. 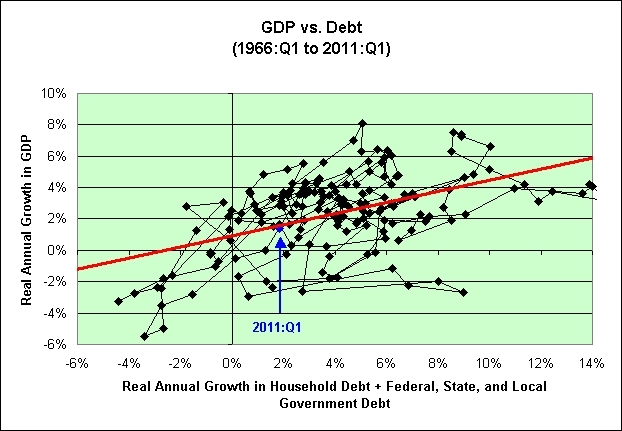 In any event, what we are seeing in these charts is certainly not prosperity being formed. Of that I am quite certain. The 20 year TIPS yield hit a new low of 0.64% today. 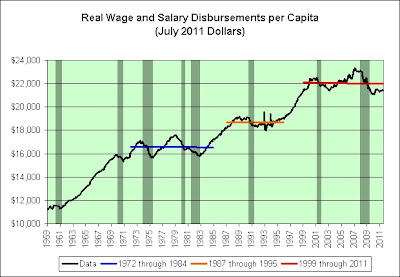 Let's assume that inflation averages 2.5% per year for the next 20 years. That's what the bond market believes. 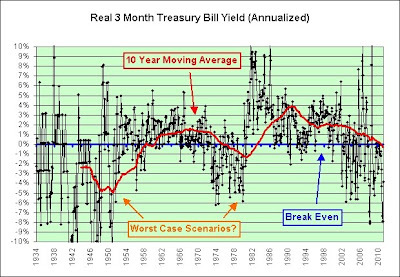 This can be seen by subtracting the 0.64% real yield on the 20 year TIPS from the 3.14% rate of nominal 20 year treasury bond. You end up with 2.5%. Now let's assume that you earn 3.14% per year in interest over the next 20 years and that you are in the 28% tax bracket. That leaves you 2.26% as an after tax return. Since inflation is 2.5% that means that you will lose 0.24% per year in purchasing power. If investors are willing to lock that in as an alternative to being in the stock market, then what does that suggest about the long-term stock market performance over the next 20 years? Well, no. Investment assumptions themselves don't worsen the crisis, but as we explain in our story on Rhode Island on Wednesday's broadcast, decisions about pension fund investment assumptions can mean higher taxes, lower pensions and bitter politics. Why? Because the lower the assumed rate of return, the greater the official underfunding of the retirement plan, the more that taxpayers or workers must contribute to make up the shortfall that would arise from a more sober assumption. For what it is worth, my assumed real rate of return is extremely low (-2% after taxes) and has been since 2004. I based it on a 1970s scenario that would never end. There is nothing written in stone that guarantees that after tax returns must be positive. There, some couples have to fake their own divorces so they can get third mortgages and bank loans to buy properties. And others are actually getting real divorces worried that a fraudulent divorce might come back to haunt them. In other cases, real estate agents are helping couples with forged marriage licenses and documents to prove local residency and allow buyers to purchase more properties. Those savvy Chinese! What will they think up next? NEW YORK — The stock market turmoil caused by the downgrade of the USA's triple-A credit rating caused mutual fund investors to dump U.S. stock funds at a rate not seen since the height of the panic during the last financial crisis in October 2008, the latest fund flow data show. The S&P 500 was above 1200 for a few hours today but could not stay there. This comes as a huge shock and disappointment to the followers of the Rubicon cult. Cheer up! There may be MANY more opportunities to permanently cross 1200 as we usher in a new wave of never-ending debt-based prosperity! It's like playing with half a deck. Oops. That's not what I meant to say. I'm trying to be optimistic here. Let's try again. I see the house of cards as half full! Ack! I did it again. I mentioned housing. One last try. Surely this must be the last time we ever cross above 1200! Pure optimism! What? We're already below 1200 again? Seriously? WTF! I practically slept through one of the most important technical indicators of the last decade! Okay, I'll let you in on a little optimistic secret. #27 will be the final crossing. I can feel it in my bones this time. It's gonna stick or my name isn't Rip Van Rubicon! I've zoomed in on the yields from -10% to 10% in order to better show the detail. In other words, some of the data is off the chart. 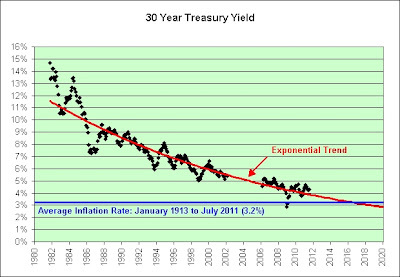 This chart explains why I was and am willing to lock in real yields on long-term treasury inflation protected securities (TIPS). If you thought the real yields of the 1970s were bad, then just look at World War II. Real yields can potentially get a lot worse. 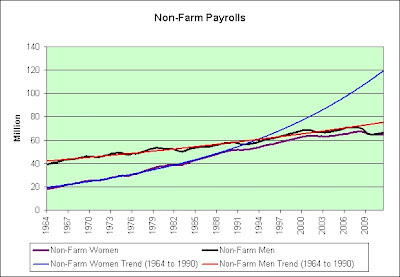 The following chart shows the exponential growth of non-farm payrolls by gender. 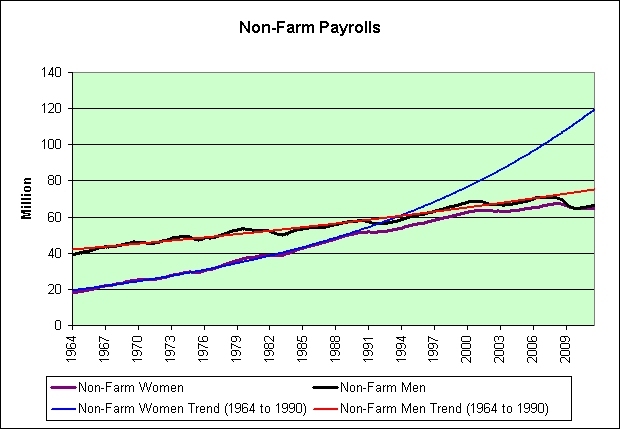 I've included an exponential trend line for each gender based on the trend that was established from 1964 to 1990. 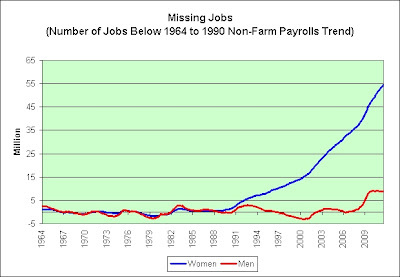 The next chart shows the difference between the number of jobs and the trend line. 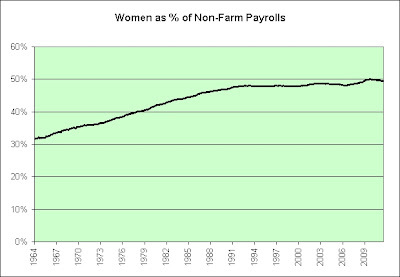 The exponential growth in payroll jobs for women has failed and it has failed spectacularly. What caused this? Math! That's all it took. 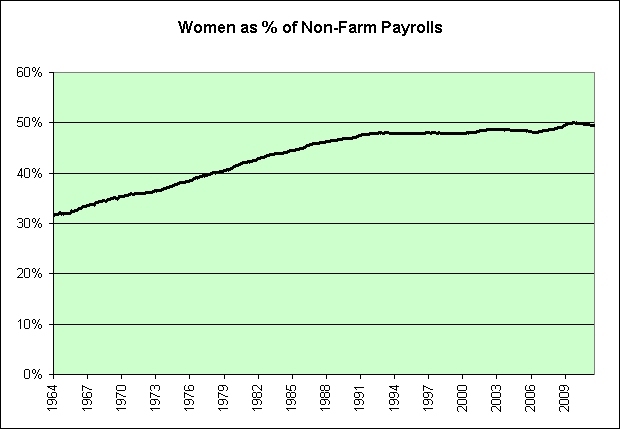 Note that women now make up 50% of payrolls. That trend reached its logical conclusion. It's over and we need to adapt to the new reality. Here's something else that will most likely cause us to adapt. What's going to happen to the previous charts when the following long-term trend starts forming? 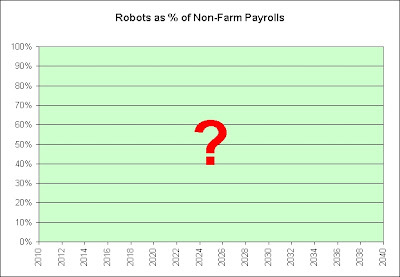 What's going to happen if Corporate America's new wave of robot workers decide not to shop at our country's many strip malls? Then what? And lastly, check this out. 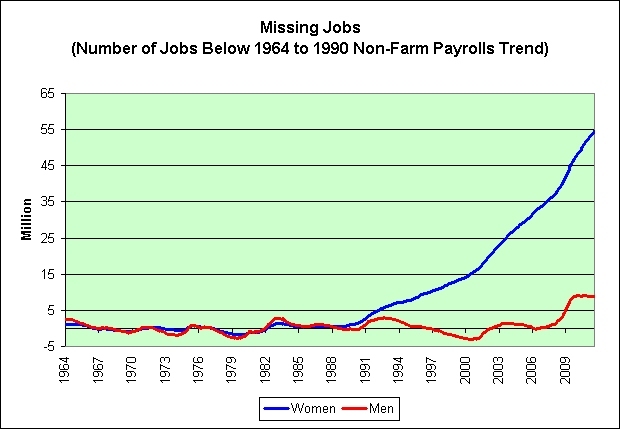 Compare and contrast it to the missing jobs for women. I'm not suggesting that they are directly related. I doubt that they are. 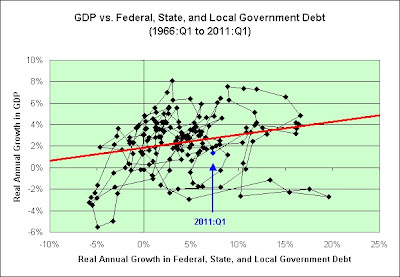 I just find it interesting that the two shapes are so similar (and that neither trend is our long-term friend). I can't describe it, what I'm feeling and what I'm thinking. This means something. This is important. You might not know this but one of my responsibilities as Commander in Chief is to keep an eye on robots, and I am pleased to report that the robots you manufacture here seem peaceful, at least for now. 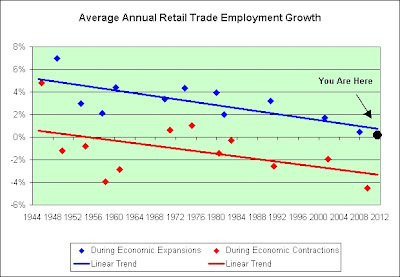 Why doesn't this happen in other recessions? Um, well, maybe because gasoline isn't generally near an all time high price when unemployment is over 9%? Just a hunch. And what caused gasoline to be so expensive? 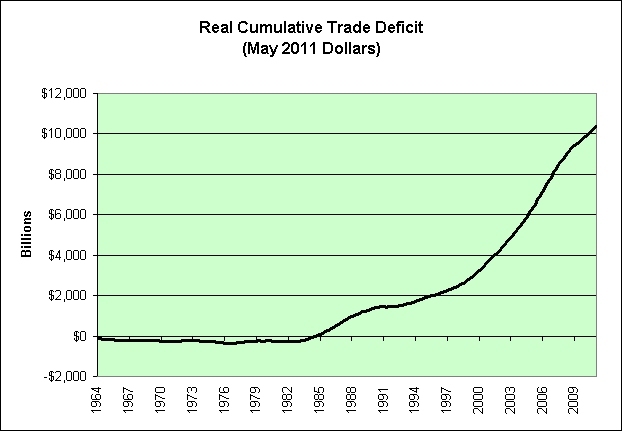 I suspect it might have something to do with our $10 trillion cumulative trade deficit (adjusted for inflation) combined with our negative real interest rate policies. Once again, just a hunch. That leaves gas prices. The U.S. may want to consider creating a price ceiling for average gasoline prices, perhaps at around $3.50. In order to ensure that consumers don't have to pay more than that for gasoline, one step could be to relax taxes when prices begin climbing past that mark. When taxes can't be lowered any farther, perhaps subsidies can help cut prices. Yes! Let's try that 1970s thing again! Woohoo! 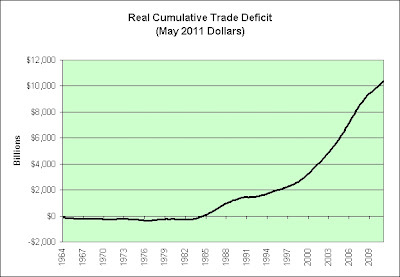 Government price controls further exacerbated the crisis in the United States, which limited the price of "old oil" (that already discovered) while allowing newly discovered oil to be sold at a higher price, resulting in a withdrawal of old oil from the market and the creation of artificial scarcity. The rule also discouraged alternative energies or more efficient fuels or technologies from being developed. The rule had been intended to promote oil exploration. This scarcity was dealt with by rationing of gasoline (which occurred in many countries), with motorists facing long lines at gas stations beginning in summer 1972 and increasing by summer 1973. Various secondary effects occurred, notably toilet paper panics in Japan and the United States; these were unfounded panics which became self-fulfilling prophesies, and are classic examples of the Thomas theorem. Price rises and unfounded rumors of a toilet paper shortage – based on oil being used in paper manufacturing – caused a panic and hoarding of toilet paper in late October and early November in Osaka and Kobe, among other cities. In the US, Johnny Carson inadvertently caused a three-week panic when, on December 19, 1973, he read a news item regarding the US government falling behind on bids for toilet paper and quipping that the nation faced a toilet paper shortage on the Tonight Show. I'm fully prepared, lol. Sigh. In all seriousness, I only hoarded toilet paper because I felt it would perform better as an investment than most safe alternatives in this negative real yield environment. Ben Bernanke tried to force me to buy risk assets. I opted to buy something else. I'm not exactly sure how it helps our economy long-term though.